This all-occasion California gift can’t be beat! 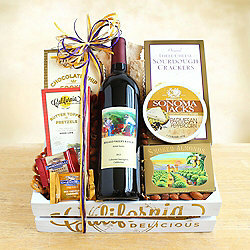 Our signature California Delicious wooden crate is packed with a superb red wine, creamy California cheese and snacks. Sweet and savory- all arranged to impress.